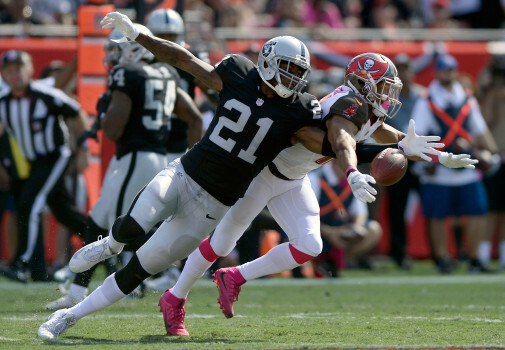 A superior court judge ruled there is sufficient evidence for Raiders cornerback Sean Smith to stand trial for allegedly assaulting the ex-boyfriend of his sister, Jerry McDonald of Bayareanewsgroup reports. Smith was present at the preliminary hearing at the Pasadena Courthouse, but did not testify. He left the courthouse without speaking to reporters and is scheduled to be arraigned on Jan. 3. Felony charges against Smith include assault by means of force to produce great bodily injury and battery with serious bodily injury. If convicted, Smith could face a maximum of seven years in prison. The Raiders were off with no media availability Thursday and a team spokesman could not be reached for comment. According to testimony, Smith, 30, joined the alleged victim, Christopher Woods, his sister Rayna Smith and cousin Alicia Brown for drinks in Old Town Pasadena on July 4 after the three had spent the day drinking vodka. Brown testified that Rayna Smith became combative, with her brother attempting to calm her down. Two witnesses testified they saw a man identified as Smith stomp the head of Woods, who was bleeding and unconscious, near the corner of Colorado Blvd. and Arroyo Parkway. Woods testified that he does not remember the attack, waking up at Washington Hospital where he was treated for facial fractures that necessitated a metal plate and screws underneath his right eye and reconstructive surgery on his left eye socket. Smith has also been served with a civil suit for unspecified damages, the Times reported. Smith has declined comment since his arrest on Aug. 17, and Raiders coach Jack Del Rio made his only public comment on the issue on Aug. 21.